Manually navigate to /review in your browser. Middle click on the "Review" icon in the header. ... neither of which are obvious. When review banned, left clicking on "Review" icon goes to /review (which shows the user they're banned, how long for, and for what reason). A key part of banning a user from review is the education that comes in the suspension message. Currently, not only is it confusing as to whether a user is banned or not, but we're also making it extremely hard for them to learn from their suspension. Just send a notice. It pops up in something most people actively use anyways and it would be useful because you could see the reason right there. Not the answer you're looking for? 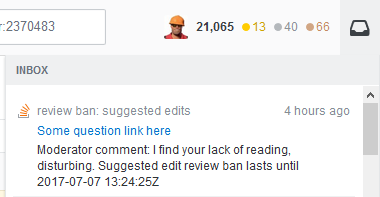 Browse other questions tagged feature-request review top-bar review-suspension . Is there a way to know if I am in review ban and when it will end? Am I in a review ban? Or are the reviews down? 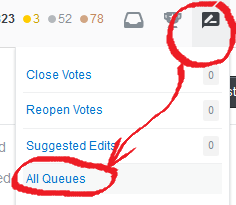 Review-ban duration not showing anymore?